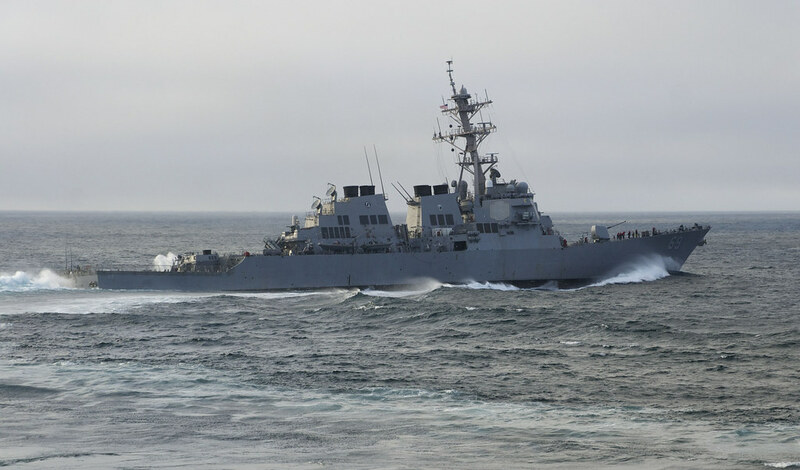 PACIFIC OCEAN - The Arleigh Burke-class guided-missile destroyer USS Milius (DDG 69) entered the U.S. 7th Fleet area of operations, May 14, to join the Forward Deployed Naval Forces (FDNF) in Japan. Milus joins Destroyer Squadron (DESRON) 15 to support security and stability in the Indo-Pacific region by bringing enhanced missile defense capabilities as a ballistic missile defense (BMD) platform. With its Aegis BMD system, Milius has the ability to provide regional, as well as homeland, defense support and can intercept short to intermediate-range, separating and non-separating ballistic missile threats above the atmosphere and shorter-range ballistic missiles within the atmosphere. A U.S. Navy destroyer is a multi-mission ship that can operate independently or as part of a larger group of ships at sea. Milius is equipped with a vertical launching system, Tomahawk cruise missiles, torpedoes, guns and Phalanx close-in weapons systems. Upon arrival at Fleet Activities Yokosuka, Japan, the ship is scheduled to undergo a regular maintenance period while the crew and their families settle into the area. Milius follows USS Benfold (DDG 65) and USS Barry (DDG 52) as the final destroyer to transition from U.S. 3rd Fleet to U.S. 7th Fleet as part of the U.S. Navy’s strategic laydown and dispersal plan to rotate newer and more capable units into positions to maintain presence and coverage across the Indo-Pacific region to provide security and stability to the forward deployed Navy.